Gorge Fly Shop will load your new reel or spool purchase with at your request. We use Premium RIO and S/A Dacron backing in 20lb or 30lb and several color choices. We also sell Hatch premium Braided PE backing as an alternative choice. You can compare it with the chart below or view the Backing Guide link above for more information about backing. 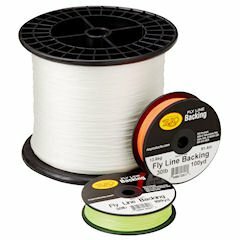 Looking for maximum amount of backing but don't want an over-stuff your reel? Consider Hatch backing! Reel manufacturers generally give you maximum specifications of backing capacity and in many cases these numbers are over-inflated...Just like gas mileage figures on new cars...to look more attractive they are generally the absolute maximum they can be...You'll likely experience less than these figures. So before you request the maximum specification of backing yards please ask yourself this; How much do I really need for the intended purpose of the reel I am purchasing? Personally I find that over-stuffed reels are an aggravation on the water and takes away from the pleasure I wish to pursue. "excellent customer service and advice"
Review (Tell us Why? : I have to start by saying about the excellent customer service and advice I received from the GFS team, this was out of this world & hence and I will definitely purchase again from the GFS. Thanks very much for placing the backing on my new reel. Review (Tell us Why? : When I buy larger items like rods and reels this is the place to shop. Great prices and new name brand items. They always arrive in about 3 business days. on my last order they even put the backing and line on my new Sage reel. Perfect . Now all I have to do is go fishing. "Wow - 8ncredibly Great Service!!!!" Review (Tell us Why? : Excellent prices on Lamson Liquid 3 pk., a Rio Bass Taper line, backing, some leaders, tipper material. AND, backing and line loaded correctly. But the best part is that I had the goods on the third day - ordered Friday a.m., received all on Monday - over 2000 miles away! Now, that's Excellence. Don't even think about it - just get your fly fishing stuff from Gorge!